"Egypt: The Time of Pharaohs" opens to the public Feb. 15 and runs through Aug. 16 at the Cincinnati Museum Center. Museum workers offer up the first reveal of the bust of Hatshepsoot, Egypt's longest-ruling woman. Workers use a forklift to load the 1,740-lb bust onto its pedestal. A bronze cat from 6th-3rd century B.C. is covered in glass. CMC's Director of Communications Cody Hefner says the exhibit will offer "a snapshot of of life in ancient Egypt." The sound of drills punctuates an otherwise silent corridor of the Cincinnati Museum Center, where museum curators, photographers and reporters have gathered to see the Pharaoh Hatshepsut, Egypt's longest-ruling woman, revealed for the first time ever in America. The large bust is part of the museum's upcoming exhibit, "Egypt: The Time of Pharaohs." In fact, the collection Hatshepsut is a part of is one of the largest groups of ancient Egypt artifacts to ever travel, with more than 350 artifacts. "This is the U.S. premiere," says Cody Hefner, director of communications for the Museum Center. "This has toured Europe, it has been in Victoria, Canada, but this is the first time in the United States. And actually, once it leaves Cincinnati Museum Center, it travels to Australia, so for everyone in America this is their shot to see this exhibition before it leaves for another year or so." Other pieces include a bronze cat from 6th to 3rd century B.C., and a 3,000-year-old slab of limestone carved and painted with a man. "The thing which is very nice is we have a whole figure," says Claudia Schindler, a curator from the Roemer-Pelizaeus Museum Hildesheim in Germany, from which the piece is on loan. "You can see the feet, you can see the head of this figure. Oftentimes you have objects cut in the middle or you don't have the whole figure. But in this case, you have a whole man holding flowers, and it's part of a big scene." 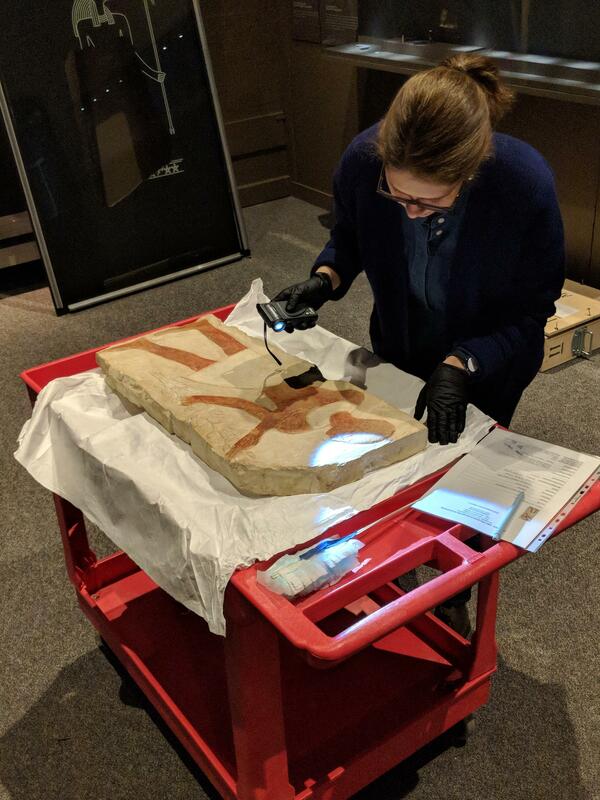 Curator Claudia Schindler examines the large limestone slab painted with a man after it was removed from its packaging. Hefner says the exhibit will be a snapshot of life in ancient Egypt. "Of course we're talking about pharaohs, we’re talking about Egyptian gods and goddesses, mummification, and afterlife and things like that; but we're also talking about the economy and daily life and what people and status in society was like," he says. "Egypt: The Time of Pharaohs" opens to the public on Feb. 15 and runs through Aug. 16. You can get a sneak peek now by clicking the photo at the top of the page. For someone who's been dead for 1,900 years, "Umi" certainly is getting out a lot lately. Fresh off a stay at Mount St. Joseph University as part of the Curate My Community initiative, the Cincinnati Museum Center's Egyptian mummy visited Northern Kentucky University Thursday for X-rays and a CT scan. A University of Minnesota fossil collection - with many specimens gathered by a Cincinnati paleontologist - will make its permanent home at the Cincinnati Museum Center. The unboxing and cataloging of tens of thousands of fossils is expected to take three years. The Cincinnati Museum Center's grand reopening is Nov. 17., when visitors will finally get to see the renovated museum spaces, new dinosaur exhibits, and the perennial favorite holiday trains. WVXU has been following the Union Terminal renovations since the beginning, and now we're looking back at the project over the last four years.